February 8, 2019. 7:30pm, Friday. Parhelion Trio + SugarCave in Concert. @Areté. Brooklyn, NY. December 15, 2018. 7:00pm, Saturday. Parhelion and Mazumal play a double bill. @Spectrum. Brooklyn, NY. August 2018. New Music for Strings Festival (NMFS), Parhelion Trio in Residence. Denmark & Iceland. August 14, 2018. 8pm, Tuesday. NMFS Chamber Concert II: Inspired by Folk Music. @Vor Fruhe Kirke. Aarhus. August 16, 2018. 7:30pm, Thursday. NMFS Gala Concert with NMFS Chamber Orchestra. @Musikhuset Aarhus, Symfonisk Sal. Aarhus. August 17, 2018. 7:30pm, Friday. Copenhagen NMFS Gala Concert with NMFS Chamber Orchestra. @The Royal Danish Academy of Music, Studiescenen. Copenhagen. August 24, 2018. NMFS Chamber Concert Finale. July 30 - Aug 6, 2018. Parhelion Trio Residency at Avaloch Farm Institute. Boscawen, New Hampshire. Canadian pianist Andrea Christie is a versatile performing artist with a flair for late-romantic works and a passion for contemporary music. Equally at home as soloist and chamber musician, she is the pianist of the NYC-based Parhelion Trio, an all-female ensemble that is dedicated to performing new and adventurous music. Recent appearances include performances at Harpa Concert Hall in Reykjavík, The Royal Danish Academy of Music in Copenhagen, and at New York City's leading concert venues including Carnegie Hall's Weill Recital Hall, Metropolitan Museum of Art, Symphony Space, and National Sawdust. A native of Victoria, Canada, Christie has been playing piano since the age of four. Her formal training began at the Victoria Conservatory of Music, where she made her solo orchestral debut at age 14, performing Rachmaninoff’s Second Piano Concerto. Andrea Christie received her Doctor of Musical Arts and Master of Music degrees from SUNY Stony Brook and completed her Bachelor of Music at the University of British Columbia. Her principal mentors include German Diez, Christina Dahl and Jane Coop. 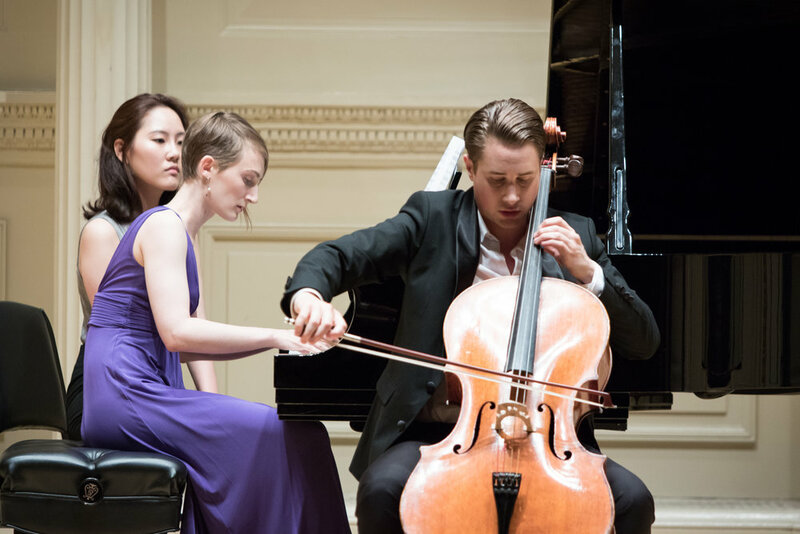 As a recipient of numerous scholarships and fellowships, Christie has performed in residencies and summer festivals across North America and Europe including Tanglewood, the Mozarteum, Academy Prag-Wien-Budapest, Eighth Blackbird Creative Lab, Avaloch Farm Institute, International Festival of Contemporary Music at Mannes, Icicle Creek Chamber Music Institute, Vancouver International Song Institute, Orford Academy, and Morningside Music Bridge.